Sinn Fein has said it is willing to help find a way to deal with armed groups, including former Provisional IRA elements, as it was confirmed that multi-party crisis talks are to go ahead at Stormont next week. The two main unionist parties are to take part in the talks after they expressed satisfaction that their preconditions have been satisfied. Allegations over the continued existence of the Provisional IRA arose after the PSNI police linked individual IRA members with the murder last month of east Belfast republican Kevin McGuigan. Sinn Fein’s Martin McGuinness has suggested that British state agents may have been behind the killing, as well as the related murder of former IRA commander Jock Davison four months ago. However, almost twenty ‘mainstream’ republicans including a number of former PoWs have been arrested so far. None were charged in connection with the killing, but unionist politicians interpreted the arrests as proof of PIRA involvement. They also dismissed assurances such as those by former Provisional IRA figure Bobby Storey, one of those questioned, who on Sunday graphically described the IRA as being like a “butterfly” that has flown away. But Sinn Fein’s support for efforts to deal with armed groups has reportedly helped sooth unionist nerves, as well as plans for a formal assessment by British intelligence of IRA groups. British Direct Ruler Theresa Villiers said on Friday that she is to appoint three people to examine findings from MI5 and the PSNI Special Branch on the “structure, role and purpose” of illegal organisations. Ms Villiers said the panel’s “factual assessment” would be published by mid-October and would “inform” the parties’ conclusions in the talks. She also said she intended to increase the capability of agencies working against organised crime. In response, the DUP leader Peter Robinson said he was “content” with the “progress” in preparations for the talks procss, and confirmed his would be taking part from Monday. The Executive survived this week without any unionist ministers, a situation that is likely to continue until the talks conclude. The DUP Ministers have already completed their first cycle of resigning, withdrawing their resignations, and then resigning again. The process is intended to allow the powersharing administration to stagger on while the talks take place. During last week’s proceedings at the Stormont Assembly, the DUP benches in the chamber were empty amid an unannounced boycott. 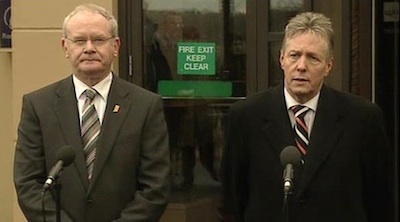 The nationalist SDLP condemned the “distraction politics” of the DUP. “It is beyond farce that DUP ministers clocked in and clocked out within hours as their political games continue to destabilise the local economy and put hundreds of millions of pounds of investment at risk,” said Patsy McGlone. Sinn Fein’s Martin McGuinness said he was pleased all-party talks would get underway and said Sinn Fein will be entering them as a party “totally and absolutely committed to a peaceful and democratic way of moving forward”. The Deputy First Minister said the talks would tackle “big issues” around the implementation of last year’s Stormont House Agreement and ensure a “workable budget” for the North’s political institiutions. He told reporters the Stormont parties had a collective responsibility “to stand together against criminality, violence and the existence of all armed groups”. He described the planned MI5 assessment of Provisional IRA structures as a “one-off situation”, but he supported a mechanism “to put all those engaged in terrorism and criminality out of business once and for all”. “If we end up in a situation where the body comes forward with the report that creates further problems for the process, then it will all have been a waste of time,” he said. “I don’t think that is going to happen. In a development that suggests some choreography is taking place behind current events, the PSNI said they seized a cache of weapons in west Belfast yesterday. It included a large quantity of Semtex explosive, which is traditionally associated with the Provisional IRA. Sinn Fein leader Gerry Adams said whatever reservations his party may have about the role and involvement of the British security agencies are secondary to the resolution of the crisis in the political institutions. In an interview, Mr Adams said that Sinn Fein were prepared to deal with the issue of armed groups, but (paraphrasing a previous MI5 report) that the Provisional IRA had ‘withered on the vine’. However, he did not accept the views of former 26 County Minister for Justice Michael McDowell and former Taoiseach Bertie Ahern, that an unarmed PIRA structure was left in place to guard against a power vacuum being filled by breakaway IRA groups. “Are there still people masquerading as IRA people? Are there former IRA people who people may think are the IRA? Yes. The only republican organisation leading the republican struggle is the Sinn Fein party, and the only republican leadership there is the Ard Chomhairle of our party.